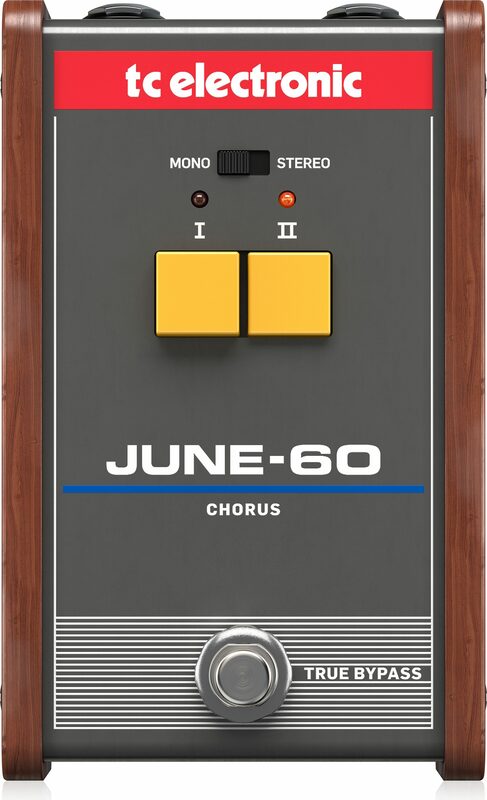 JUNE-60 CHORUS is a faithful recreation of the lush chorus circuit found in the legendary Juno-60* synthesizer - the iconic synth sound that fueled countless '80s hits and defined the cult movie themes of an entire era. Now you can bring the adored chorus sound from one of the most revered, classic synthesizers back to the future. But don't worry - TC is keeping it old school. 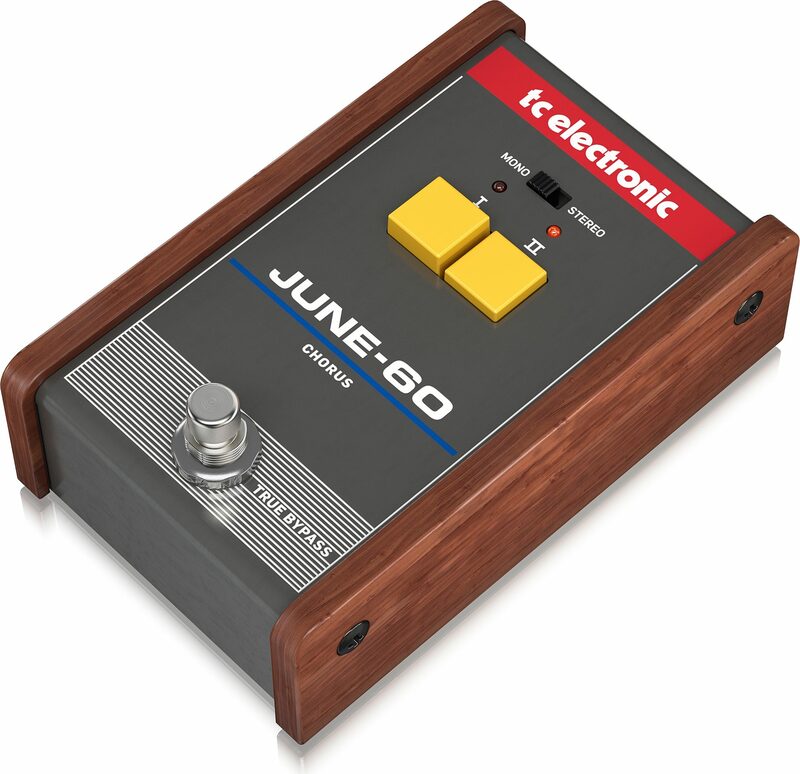 JUNE-60 brings the recognizable sound of all your favorite classic eighties synth themes to the world of guitar. Just like the original Juno-60, you only get two buttons to work with - less is more, right? Simply plug in, press a button or two, and write the intro for the next sci-fi cult classic. Button I gives you a slow moving, rich chorus, perfect for thematic synth tones, while Button II presents a faster, wobblier chorus for a thick, groovy tone, that also works quite well for painting a swirl on a hard-rocking shred tone. Combine both modes for a swirly "dual" chorus with double sine curves battling each other for total tonal supremacy! A great chorus fills the room with a warm wobble while blending in nicely with other instruments. And while chorus is great no matter the setup, a stereo rig is where the chorus effect becomes magical. 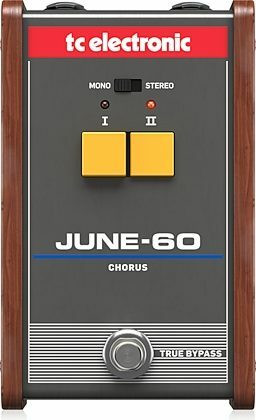 With the flick of a switch, JUNE-60 converts the output from mono to stereo, giving you those deep and sultry, pulsating tones that engulf the aural space. That being said, mono is still pretty darn sweet. 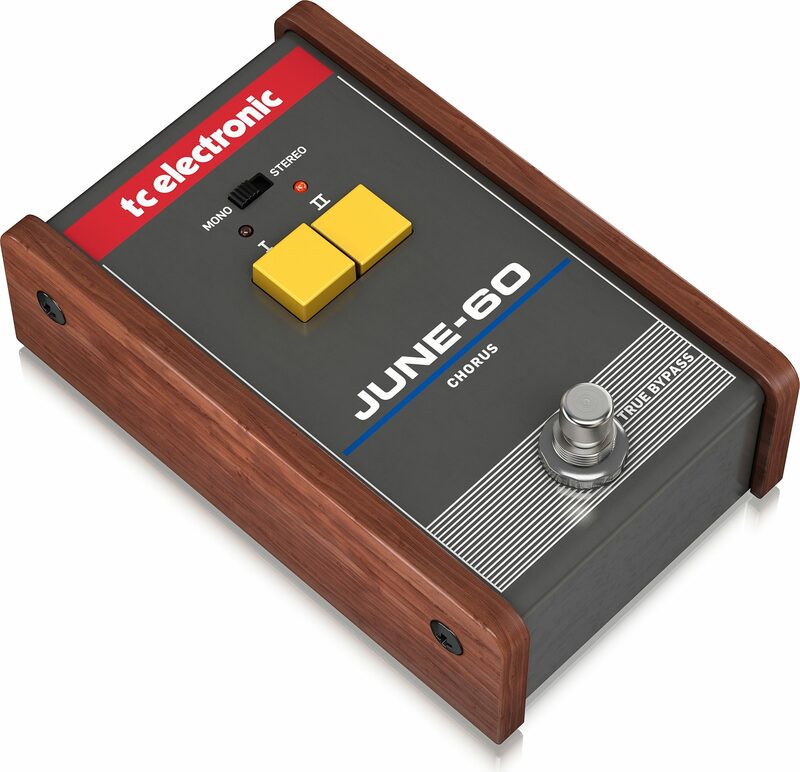 To keep the sound of JUNE-60 authentic, TC called in the brigade - a bucket brigade delay circuit that is! 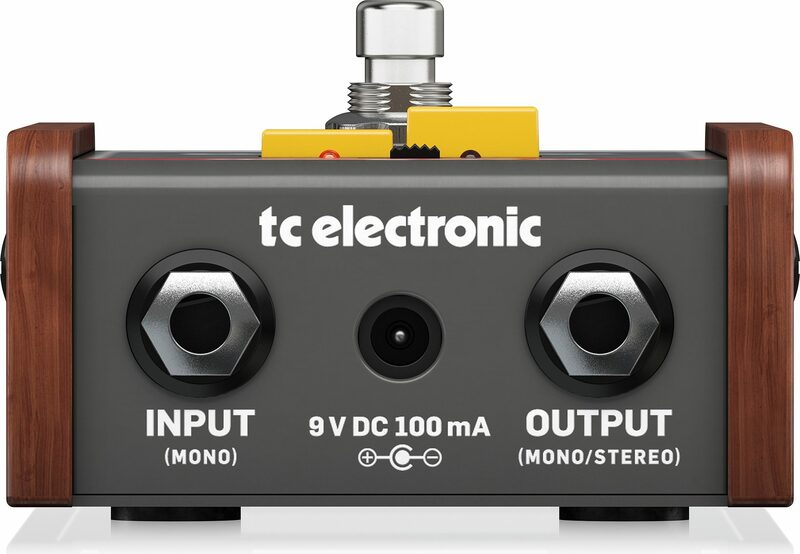 This tried and true piece of analog circuitry is the same design used in the legendary Juno-60 synth, as well as a bevy of other sought-after analog choruses. Going all analog is the only way to achieve that unmistakable timbre and touch of the original. In this case, the old way truly is the best way. JUNE-60 will stand up to any sort of gigging abuse on the road, while delivering crispy true-bypass tones that won't eat your clean sound. With dark wooden panels on the sides, JUNE-60 is tastefully vintage and adds a sophisticated look to any board. The earthy wood details are subtly balanced by the warm, yellow buttons and the top-mounted jacks handle close quarter pedalboards with ease. close [x]More ExpectedWe have been given a date of Jul 11 for the arrival of this item. This date is not guaranteed, rather an estimate based on either information obtained directly from the manufacturer or historical delivery data for the specific manufacturer.